Reduce heat load, operating cost, eye fatigue, UV damage, increase employee comfort and save energy for your office. Preserve your view and investment with commercial sun control window tinting films from ABC Sun Control. Commercial window tinting film can enhance the performance of any glazing system, save energy, improve comfort, add safety and update aesthetics. We provide window film that is low-cost, high-return technology that compares favorably to other popular energy-saving measures both in terms of energy efficiency and cost savings.Commercial window film has helped Microsoft Boeing and Amgen and can help you to enhance the performance of any glazing system, save energy, improve comfort, add safety and update aesthetics. A building can only be energy-efficient to the extent that its windows are energy-efficient. In summer, windows allow too much heat to enter, forcing cooling systems to work harder and making cooling costs climb. But in winter, they allow too much heat to escape, forcing heating systems to work harder and making heating costs climb. 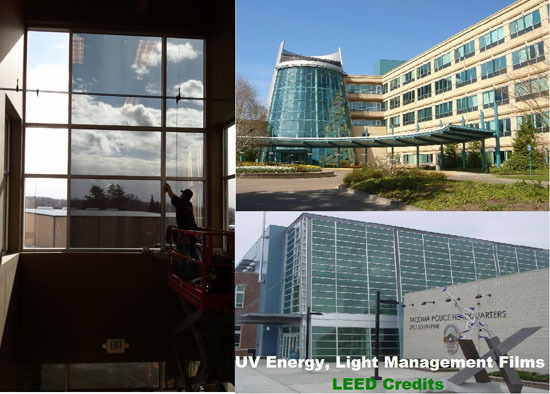 Window tinting films also allow you to qualify for LEED credits. The products we offer provide employee comfort, reduced eye fatigue, lowered operating costs and with "One Way" Film, we can enhance privacy.